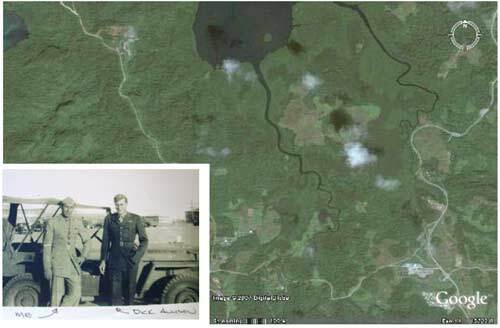 in this photo, despite two intense seasons of searching, lie the remains of 1st Lt.
Bruce, still waits for his return home. We will keep looking for you, Lt. Allison. During 23 February – 23 March 2008, I made my seventeenth return to Palau, this time with the P-MAN X team for 4 weeks, continuing our search for Americans missing there since WWII. [NOTE: when service members go missing, they are initially designated as either "Prisoner Of War" (POW) or "Missing in Action" (MIA). After someone has been missing (and is not known to be a POW) for a year, the official designation is changed (to facilitate family insurance claims) to "Killed in Action, Body Not Recovered" (KIA/BNR)]. Like last year, this year we carried with us new archival data and photographs, from both American and Japanese sources, in addition to our ongoing leads to guide our explorations. Of particular note is that through the help of team members Mark Swank and Katie Rasdorf, we had a great deal more intel concerning the American POWs who were executed in the Ngatpang area. The P-MAN X team comprised a broad base of expertise and capabilities concerning Palau in four of the six team members. Major Grover Harms, US Army, West Point graduate and former member of Joint POW/MIA Accounting Command, Hawaii (JPAC), whom we first met in Palau in 2005, volunteered to help the team with his logistical and military skills. Major Laura Regan, US Air Force, Air Force Academy graduate and the only active-duty forensic anthropologist in the Department of Defense, offered her skills, particularly of value for our land searches. Laura is assigned to the office of the Armed Forces Medical Examiner. The BentProp Project has been reporting and coordinating its efforts for several years with JPAC. This year JPAC sent three teams to Palau (two recovery, one search), two of which were present during during a portion of the BentProp trip. One of the Recovery Teams had investigated a TBM crash site on Peleliu (which had been located and identified by BentProp in 2006) and had returned to Hawaii before this year's BentProp team arrived. During our first week in Palau, the other Recovery Team was just completing JPAC's third and final recovery mission to the B-24 site that BentProp had located and identified in 2004. During our first week in Palau, we conducted our separate missions as well as interacting with JPAC on several occasions to share findings and data. While the JPAC Search Team was still in-country, we conducted several field missions together. In addition, the BentProp team continued its interactions with the Palauan Historical Preservation Office (HPO) and other agencies. We also continued our dialog with many key Palauans, including Palau’s Vice President Elias Chin, the President’s Chief of Staff Billy Kuartei and Senator Surangel Whipps. Mr. Shallum Etpison graciously arranged an introductory meeting for the team with the Governors of Koror, Ngatpang, Ngeremlengui and Airai, so that we could present our mission proposals for their states. The team also met with several chiefs and elders to discuss the mission and gain their advice. NO FINDINGS: P-MAN X-6 (Possible Aircraft Debris, Koror Road Conservation Area): Reported by Palauan elder, no debris found. 03 March 08 and 22 March 08 (fly-over only). NEW INTERVIEWS: Many other American aircraft lost over Palau have never been found. Accordingly, the P-MAN X team continued to request and conduct videoed interviews (with permission) with Palauans to seek information leading to additional crash sites, MIAs or POWs. The team conducted approximately 26 interviews with Palauan elders and hunters in Ngeremlengui, Ngatpang, Aimeliik, Airai, Meyuns, Koror and Peleliu. Brief summaries of these interviews are included in Appendix 3. NEW TARGET-1 (NT-1, Jungles and Underwater, Ngardmau, Ngaraard and Ngiwal): Guide was not available during mission. RETURN TARGET-3 (RT-3, Corsair, mangroves of Northwestern Ngeremlengui): Since JPAC has targeted this site for recovery, no need to resume search. RETURN TARGET - 4 (RT-4, Possible Aircraft debris, Coral Jungle, Ngeruktabel): Palauan guide not available. RETURN TARGET - 5 (RT-5, Possible Aircraft debris, Coral Jungle, Ngeruktabel): Palauan guide not available. PALAUAN TARGET -1 (PT-1, Report of Aircraft Debris, jungles, Ngeruktabel): Palauan guide was not available. PALAUAN TARGET - 2 (PT-2, Report of Aircraft Debris, in water off SW Babeldaob: Palauan guide not available. REPORTING: Preliminary findings of P-MAN-X to the Palau Historical Preservation Office, Palauan Office of the President, Office of Vice President, JPAC and NHC, 22 March 08. This year’s team had two new members: Laura Regan and Grover Harms. Some of the team met Grover on our last day of Mission P-MAN VII (2005), when he was the JPAC Officer-in-Charge for that year’s JPAC Recovery Team. Because of his interest in our project, Grover contacted me after returning from his combat tour in Iraq and it just seemed natural to invite him to join the P-MAN X team - as far from the desert as possible. In addition to being a West Point graduate and a logistics expert, he has a unique positive and ‘can-do” attitude that is downright infectious – and he applied these talents the entire month during P-MAN X. Laura Regan, one of our non-flying Air Force Academy graduates, is assigned to the office of the Armed Forces Medical Examiner. She has the distinction of being the only active duty forensic anthropologist in the military. She also has worked with JPAC on field missions and, because we wanted to expand our search for the American POWs in Ngatpang, we were especially fortunate to have her on board. Her scientific rigor combined with Grover’s organizational skills added much to the team’s capabilities. This year one our team regulars, Dan O’Brien, could not join us - and we missed him. In addition to the talents so often mentioned in prior reports, Reid and Flip also brought their “corporate” knowledge so essential on these missions. As we have seen so many times before, the P-MAN X mission had its own unique characteristics. This year, we definitely spent more time on land (jungle) than water. We made many courtesy calls upon arrival throughout Palau, including with Vice President Elias Chin, the President's Chief of Staff Billy Kuartei, Airai Governor Vicky Kanai, US Charge d’ Affaires Mark Bezner and the US Civic Action Team. Through the help of former Ngatpang Governor Shallum Etpison, the P-MAN X team also made a special presentation on 27 February 08 explaining the mission to Governor Yoshitaka Adachi of Koror, Governor Leilani Reklai of Aimeliik, Governor Takemura Erungel of Ngatpang and Governor Wilson Ongos of Ngeremlengui. We also met with several Senators, chiefs and elders. We continued conducting interviews with many locals, rotating the team interviewer each time and adding more pieces to this still-incomplete puzzle. This year JPAC, with three teams, had already been in Palau since January. One Recovery Team had completed a dig at an Avenger site on Peleliu and returned to Hawaii before we arrived. The second Recovery Team, consisting of JPAC personnel and USN Mobile Diving and Salvage Unit-1 (MDSU-1), also out of Pearl Harbor, were finishing the recovery mission (it had taken three seasons) for aircrew remains from the B-24 ‘453, which we found in 2004. The third JPAC team was continuing to conduct search missions (expanding upon information gathered previously by the BentProp Project) for American aircraft, associated with MIAs, throughout Palau. This year, some of the JPAC Search Team members accompanied the P-MAN X team on several of our searches throughout Palau. Because of JPAC, we were invited to meet Admiral “Timbo” Keating, a four-star admiral who is presently the Commander of all US military forces in the Pacific, and his wife during their visit to JPAC’s recovery barge. This was especially interesting because Flip was contemporaneous with ADM Keating when he flew F-18s – we wondered what Flip, had he stayed in, would have been like as a 4-star and decided the US Navy would have been very different. Reid also stood up once again during this mission, identifying new targets, doggedly pursuing one till we ran out of days. Finally, Grover introduced us to LT Andy Baldwin, MD, a member of the MDSU dive team – also known as “The Bachelor” from the television “reality” show by the same name. Both of us being physicians, Andy and I spoke several times and I found him a really good guy – on his off days, he volunteered to see Palauan children in a local health clinic. All this amongst our searches: it was an amazing mission. Since its inception, the BentProp Project has recognized that we are guests in Palau, an independent and sovereign country. Hence, we understand that we owe the Palauan people an explanation of our intentions before proceeding and a summary of our findings afterwards. The BentProp Project does not take lightly the generosity of the Palauan people, on both official and informal levels, and we are determined to work hard to retain the trust we have been able to create with the people of Palau. The BentProp Project also feels that, as we are investigating historical matters concerning our forces during WWII, we owe the American people a summary of our efforts. Accordingly, we coordinate our activities as appropriate with the Joint POW/MIA Accounting Command, Hawaii (JPAC), the U. S. Naval Historical Center (NHC), Washington, D. C., the U. S. Air Force Historical Research Agency (AFHRA), as well as the Charge d'Affaires of the United States of America in Palau. We send confidential (For Official Use Only) reports to these agencies, as appropriate, and we also provide a non-confidential version to the public through our website: www.bentprop.org. The members of the BentProp Project express our deepest gratitude for the spirit of cooperation, patience and interest that we receive from each person and organization. Introductory Note: As with prior BentProp Project missions, P-MAN X generated a lot of information in a non-linear manner – thus I have pooled descriptions by event or site and not by date. As many P-MAN X personal events were ably captured in the daily internet log of team member Flip Colmer and daily progress reports by Reid Joyce on the BentProp website, the summary below will focus more on the key findings. All references to specific identities of deceased individuals, human remains, and GPS readings related to these mentioned herein are considered by the BentProp team as CONFIDENTIAL/FOR OFFICIAL USE ONLY to be held for use at the discretion of the President of Palau, the Joint POW/MIA Accounting Command, Hawaii (JPAC), U. S. Naval Historical Center (NHC), U. S. Air Force Historical Research Agency (AFHRA), other related agencies of the United States, as well as the Palauan Ministry of Justice (MOJ), Historical Preservation Office (HPO) and other related agencies of Palau. This report for our web site is thus abbreviated to delete such details. The BentProp Project coordinates its activities with all appropriate Palauan authorities, national, state and local. This year, the P-MAN X team submitted before arrival a mission proposal to the Palauan Historical Preservation Office (HPO), with courtesy copies to the Office of the President and to the US Embassy. Upon arrival, one of our first calls was to HPO, after which we received written permission to proceed with our mission (see below). Written permits from the governors of Airai, Peleliu and Koror and verbal permits from the governors of Ngatpang and Ngeremlengui NOTE: No active searches occurred in Airai, Peleliu, Ngiwal, Ngardmau and Ngaraard). We also received permission from President Remengesau, through his Chief of Staff, that we may have access to search the waters around Palau. When the P-MAN X team conducted searches with JPAC, the JPAC team applied for and received permission for our joint searches.